Looking for a reliable company to transport wall art from the gallery to your home? Fine Art Shippers can do it for you quickly, safely, and at a very reasonable price! Besides, while our company mainly operates in the New York metropolitan area and along the Eastern seaboard, we also provide comprehensive art logistics services in the Midwestern United States. Fine Art Shippers even has an art shuttle that goes from New York to Chicago and vice versa at least once a month. So if you are interested in the safest yet most cost-effective way to transport wall art from the Chicago-based gallery, we would be happy to help! In particular, our team would be pleased to pick up art for you from the amazing McCormick Gallery. McCormick Gallery is a reputable fine art gallery founded in the West Loop neighborhood of Chicago in 2000. Its diverse selection of art includes many interesting items, from unique mid-century paintings to works by talented local artists. However, McCormick Gallery is largely known for offering high-quality abstract modern and contemporary art, with the focus on Post-War Abstract Expressionism. 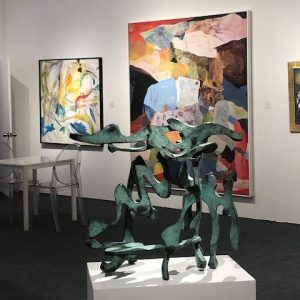 For example, you should definitely visit this beautiful gallery if you love works by Mary Abbott, Perle Fine, Jack Roth, Fred Mitchell, Milton Resnick, and other prominent 20th-century Abstract Expressionist artists. McCormick Gallery is indeed a must-visit place for all art connoisseurs in Chicago! To transport wall art or any other artwork sold via this amazing gallery would be an honor for Fine Art Shippers!